A player’s passion for soccer only increases with age. The Adult Soccer Fest, presented by US Adult Soccer, offers opportunities for players of all ages and abilities to get back on the pitch. A week built around soccer, food and beer, the Adult Soccer Fest is the largest sanctioned adult soccer event in the United States. Battle it out with old rivals or make new ones. Each of our age divisions include group play and a chance at a championship game. All ages play 11v11 except Over 65 women and Over 70 men, which play 8v8. For the young and/or the daring. The open division gives players of any age a chance to play together. The beautiful game, just slowed down. Walking soccer levels the playing field by eliminating running. The pace of the players may be slower but the competition is still fierce. Did your team struggle during the week? Join our one-day, small-sided tournament on Saturday. Small fields, small goals but big stakes. The game of soccer is meant to be enjoyed by all. 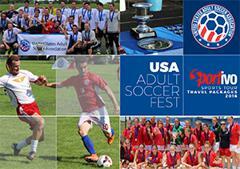 The Adult Soccer Fest offers divisions for amputee, CP/stroke/TBI, as well as dwarf players. Denver and beyond: Adult Soccer Fest travel packages are available for groups of 13 people or more. Choose from an 8 day or 14 day travel tour that includes tournament days in Denver then continues on to Las Vegas, Los Angeles and San Francisco. These packages are perfect for international teams wanting to participate in the Adult Soccer Fest and explore the US West. Click here for more information and to download travel package brochures in English, Italian, Spanish or German. 560 Room Hotel built in 1973 with restaurant, lounge/bar, indoor pool, fitness center, sauna, whirlpool, guest laundry, gift shop. The Doubletree Hotel Denver is conveniently located just minutes from Downtown Denver, Denver International Airport and the Denver Convention Center. This is a SMOKE-FREE hotel. Hotel is located 8 miles from the venue. Take advantage of our discount with Avis. Book your rental car now!